"The Secret Lives of Numbers"
"RECONFIGURABLE HOUSE: HACKING LOW TECH ARCHITECTURE"
Art & Technology Zone is an exhibition area where one can investigate the dialogue between technology and art. It presents an overview of artistic expression within information society and its context while also surveying changes of artistic style, era and social order. We want people to experience selected artworks, by representative media artists with themes and keywords such as interactivity, devices, webs, and images. A chronological table of the socio-cultural movements of media art and its context since 1990 is available for further study. 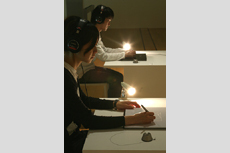 For a multi-faceted understanding, ICC provides access to a sound-absorbing anechoic room where one can experience silence; a playroom lounge for younger generations; a display of research & development by corporations, public institutions and universities; and also presents emerging artists while providing them an exhibiting space. When you trace the streets on the base map with the pen tablet provided, you will hear the sounds of each city in the headset you are wearing. These are the sounds you would actually hear in those places on the map. As you move the pen along the street, the sound changes as if you were walking down the street. By tracing both of the base maps on display, you will discover the differences in the sounds of different places. On the floor, lit by the round-shaped light are spine-like objects. It appears that the light from the ceiling casts shadows of these cone-shaped objects onto the floor. However, when you touch a cone, its shadow starts to move; for example, it rotates around the object like a sundial or expands and contracts. If you touch other cones, you will see a diversity of reactions, such as all shadows starting to move or suddenly becoming colored, as the shadows of individual cones react differently and in combination. 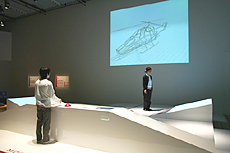 "Modulobe" is a physical simulation system that enables users to easily create "moving 3D models" of virtual creatures through combining parts called modules. With this system, users can freely develop forms, like they do with blocks, add moving modules to the forms, and provide instruction on movement to the models. 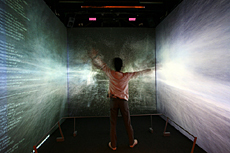 Additionally, as this virtual space simulates the actual laws of physics, users can reproduce realistic movements like those of living organisms. 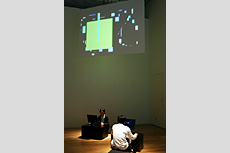 This work appears like a battle game in which two players fight face-to-face. 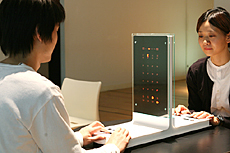 However, they cannot see the screen of the opponent because the upright screens of the two players are placed back-to-back in the center. 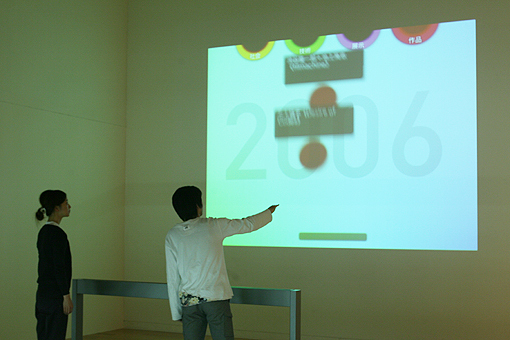 Each player participates in the game by watching the screen on his side only. Only apparently, communication is established between the two players enjoying a common game. This work collects the use frequency and the patterns of the numbers from 1 through 100,000 over the web, and presents the statistics as a dynamic interface. By dragging a mouse, we can see how the use patterns of numbers reflect our society, culture and history. "rgb f__cker" is a tool that allows anyone to be a creator and easily produce visual works consist of flashing colored squares. 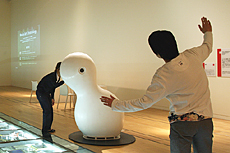 This work is also a platform to disclose the created works for the public to enjoy. The minimum rule is that users need to create squares and set their color and flicker speed; how to use them is left to the imagination of the user. There is a "house" that emits light and sound. It is packed with remodeled electronic toys, such as penguin-shaped walkie-talkies and resin-coated cat dolls, hung from the ceiling. A touch screen terminal is installed inside of the house, so that visitors can use it to "reconfigure" the electronic connection between these toys on the software. 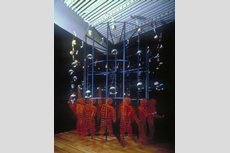 The objects thrown into the air, and the jugglers themselves, are connected to the cylindrical frame and revolve on it, and are visible to the eye only when the blinking strobe flashes on. Consequently, these motionless objects are endowed with time, like an animation, and you will see a virtual "moving" spectacle. Big waves surge in a screen-filling computer-generated ocean. When you move, as if crawling through the waves of information generated from the data, you see a link emerging between the waves. The next website is determined by the conditions of the waves, and new waves of data rush towards you again. 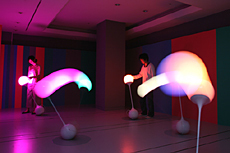 Consisting of multiple light-emitting spheres, which have a self-standing structure and are weighted at the bottom like an "Okiagari Koboshi," or a daruma doll so as to right themselves when knocked over, and the trace of their light projected on the walls and the floor, "Optical Trajectory 2" enables viewers to touch the "movement of the colors." People can experience the "materiality of movement" as the "materiality of color movement" in space, as movements triggered by touch are synchronized with consequential changes in color. If you tilt the object, the luminosity gradually increases and the sphere becomes brighter. When you turn a sphere as if drawing an arc, as the hue of the light changes so does the color pattern on the wall. 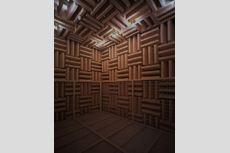 This anechoic room is covered with special materials so that the room itself absorbs all reverberations. We usually grasp the extent of the space around our body by reflected sounds. However, in this special space where there is no resonance or reflected sounds or any permeation of sound from outside, you cannot define your position, just like being suspended in space without any form of orientation. That is why you might experience feelings of pressure or uneasiness in this room. 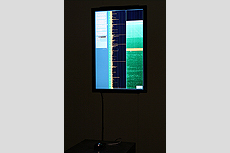 This spatial characteristic of an anechoic room is also used to experiment in creating artificial relationships between the visitor and the environment via sound. "emergencies!" 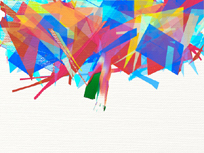 is a space that exhibits new work and projects by emerging and prospective artists. 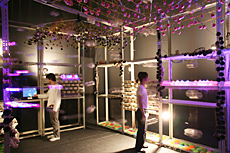 Experimental expressions, which lead to new possibilities for art and science, are presented three to four times per year. 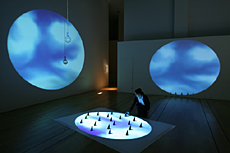 ICC aims to provide viewers with the experience of current media art in real time and the opportunity to encounter the source of each artist's ideas. This interactive chronology presents key works and exhibitions of media art after 1991 in conjunction with social and technological trends.